“AltaVista”, you will say, if you are an Internet user of a certain age; “ah yes, I used to use it before Google came along”. The news of the demise of the venerable – in Web terms at least, since it’s been around since 1995 – search engine will not cause many ripples in the Internet pond; it had too few remaining active users for that. But it’s worth taking a moment to muse why it, and almost all the other early web search engines, have gone, superseded by the system whose name is now a synonym for online searching. We could look for the explanation in the poor support provided by its succession of owners, lack of development of the initially highly original product, poor marketing, confused vision of its purpose. All these factors, and more, are set out in Danny Sullivan’s eulogy for AltaVista in Search Engine Land. But perhaps the answer is more to do with what we want from information systems. When it first appeared, AltaVista was undeniably the best of the web search engines. It had a dramatically larger coverage of web material then the others, at least for the days when we thought two million web pages was a lot. It also had facilities for quite advanced and sensitive searching, allowing precise specification of exactly what you wanted – if you knew how to use it to best effect. And therein lies the problem. 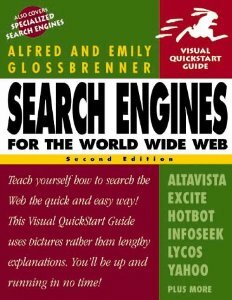 Because at that time there were a number of search engines beside AltaVista: Lycos, Excite, Yahoo, Infoseek, Hotbot and more. They all had different searching functions, and were better for different types of material. People like me ran courses on how to get the best out of them. There was even a book, Search Engines for the World Wide Web, written by Alfred and Emily Glossbrenner in 1998, which covered them all, and advised that we had to learn to strengths and weaknesses of each one, after first mastering the idiosyncrasies of them all. And then Google came along and changed everything. Not because it was necessarily a better system; it wasn’t at the start. But it covered all kinds of web material, and gave a reasonably good result most of the time. And crucially, it was quick to learn and easy to use. One of our students, Jan Brophy, in a dissertation project later written up as a journal article, established that it took several days of study and practice to get best use out of complex search engines (like AltaVista), and similar databases and catalogues; for Google, it took about three hours. And, crucially, improving searching expertise was essential for getting acceptably good results from ‘library sources’, but not from Google. This is not to say that there are not clever tricks to Google searching; there are, and in some special cases knowing them can be essential for getting good results. But most of the time they’re not needed. And one of the few things that we know with certainty about the use of information systems and services is that those which perform reasonably well all the time, and is quick and easy to use, will always be preferred to something objectively ‘better’. The phenomenon even has its own name – ‘satisficing’; the preference for the good enough, found by simple and familiar means. So Google was always going to do well. And when people starting calling any search box a ‘Google box’, the competition was over; we didn’t need to wait for the new English verb ‘to Google’. So farewell, AltaVista, victim of the iron law of satisficing. Hopefully, designers of more successful systems will give some attention to the points which once made it the best search engine in town.